In the morning when I get into lab, around 10 in the morning, I have a set routine. Make a cup of coffee or tea, update my research wiki with a new entry corresponding to the day’s tasks, write/reply to work related emails, admin phygg.com (spam management etc. ), scan/vote on papers of interest. Finally I read 1-2 papers in closer detail before getting to the day’s tasks as outlined in my wiki–which often include more targeted reading. In the interest of blogging about science more frequently, I’m going to update the morning routine with occasionally creating an entry on my purportedly science focused blog. Possible topics include: the papers I read, astrophysical object/concept of the day, research minutiae, popular physics, and more. The authors investigate γ−ray emission properties of a group of globular clusters. By investigating the possible correlations between the γ−ray power and: cluster distance, two body encounter rate, metallicity, absolute visual magnitude, energy densities of soft photon fields, and γ−ray luminosity, they attempt to pin down the origin of the γ−rays from these globular clusters. They find a positive correlation between γ−ray luminosity and the two body encounter rate as well as between γ−ray luminosity and metallicity. Voids are, to use the technical term, ginormous regions that are practically devoid of galaxies. 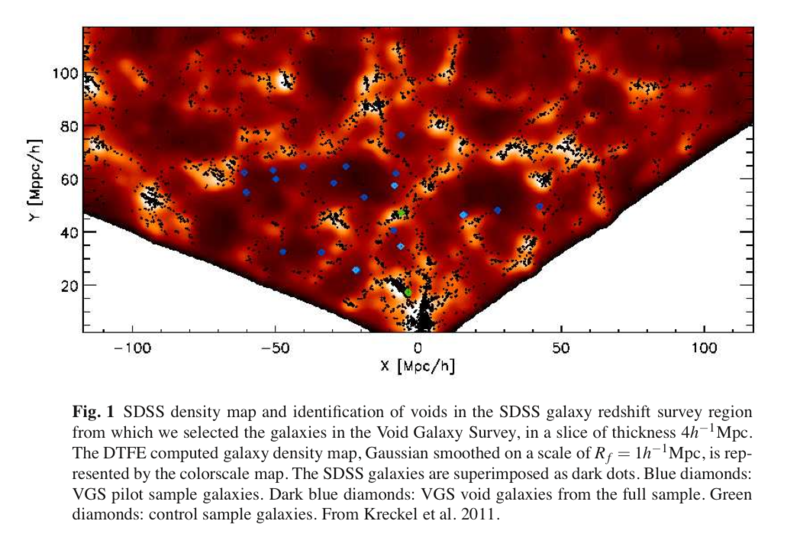 The Void Galaxy Survey (VGS) aims to examine a sample, on the order of 60, of the rare galaxies which do reside in a void. These are especially interesting as they offer a clean probe of galaxy formation processes without the complications that dense environments entail. This paper presents a few results from the first 15 galaxies and as a result is light on statistical significance but fairly tantalizing. Void galaxies in their sample are bluer and have increased rates of star formation, consistent with previous studies, and show some evidence of cold mode accretion which recent simulations have predicted.